The Group Booking Terms & Conditions below are a shortened version . Full Group Booking Terms & Conditions can be sent to you upon request. On arrival the group leader will be required to supply us with a credit card to guarantee against any damage or theft of any property. MAKE SURE EVERY ONE IN YOUR GROUP HAS FORMAL ID TO CHECK IN. The group Leaders mobile number must be given to the hostel. This must be a number that can be used by staff to contact the group leader during their stay. Leaders MUST be on site at all times while the group is in the building. The group cannot be left at the hostel with out a leader to monitor them. Group members under 18 must be supervised by a group leader while in the Bar. They will be asked for ID if they attempt to buy alcohol. It is illegal to take drugs in the UK. It will not be tolerated if a member of your group is found in possession of drugs on our premises. Coaches Please ensure your bus driver is aware they MUST turn off their engine while parked outside the hostel. Steps to evict your group will be taken if the above points are not adhered to. 12% non refundable deposit when booking. Final balance to be paid at least 14 days in advance. All group bookings made within 14 days of the arrival date must be accompanied by full payment. The above payment terms must be observed to guarantee your booking, as failure to comply will result in cancellation and any deposits received may be forfeited. No refunds will be issued to booking amendments relating to individual members of a group made within 14 days prior to the arrival of the group. If the group reduces to below 20 paying persons due to cancellation or non-arrival Euro Hostels shall be entitled to vary the rate and condition. If the booking is cancelled Euro Hostels Ltd shall be entitled to retain the deposit paid. Cancellation of the group must be made 30 days prior to arrival. Euro Hostels Ltd will always try to accommodate the leaders and drivers of groups on the same floor as the rest of the group. Mixed parties of individuals under 18 years of age must have a Leader or a responsible person aged 21 or over unless agreed otherwise. A full rooming list should be provided a minimum of 14 days prior to the arrival date. Failure to do so may not guarantee the room types booked. If a full rooming list is not sent in advance, the group leader must provide an updated rooming list together with the names of all group members on arrival at the hostel. Group leaders are responsible for allocating group members to the rooms reserved for the group. The Group Booking Terms & Conditions below are a shortened version. Full Group Booking Terms & Conditions can be sent to you upon request. 10% non refundable deposit when booking. Method of Payment: - Payment can be made either by UK Sterling Cheque,MasterCard, Visa, Switch, Delta card or International Bank Transfer. Please include your Euro Hostels reference number or the payment may not be credited to your booking. If the group reduces to below 20 paying persons due to cancellation or non-arrival Euro Hostels Ltd shall be entitled to vary the rate and condition. If the booking is cancelled Euro Hostels Ltd shall be entitled to retain the deposit paid. Cancellation of the group must be made 30 days prior. - All bookings will be subject to the pre-authorisation of credit card details. For any details not authorised the booking will automatically be cancelled. Groups of 10 persons or more must contact Euro Hostel directly to make a booking. A minimum 2 nights stay is required for groups arriving on a Friday or a Saturday. 12% non refundable deposit to paid in order to confirm booking and secure beds. 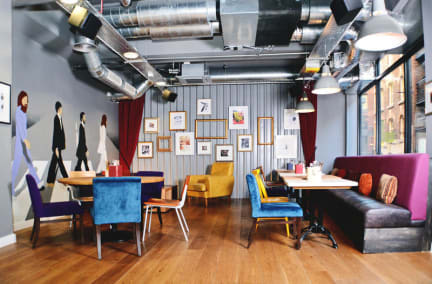 Euro Hostel Liverpool is the newest addition to the Euro Hostel portfolio and like with all our properties you can expect to be based right in the heart of the city centre. Located on the corner of Stanley Street and Mathew Street, an area made famous by The Beatles, you won't get any more central than this. At Euro Hostel Liverpool we offer contemporary accommodation at great prices. All of our rooms contain super-sized bunk beds, free Wi-Fi and en suite shower rooms. Euro Hostel Liverpool is Liverpool’s #1 City Centre hostel with hotel quality comfort for guests. Our all en suite dorms offer superb deep mattresses covered with fresh linen, and an invigorating hot shower is available for all our guests. Towels are available for hire. Dorm options range from private boutique double or twin bedrooms, 4s and 6s up to our largest dorm for 8 guests. Dorms can be privately used, female only or shared. Modern electronic door locks are installed throughout the hostel, along with 24 hour staffing and CCTV to ensure highest levels of security are maintained to allow our guests to relax and enjoy. Euro Hostel Liverpool is truly outstanding value for this premium city centre budget accommodation offer. The hostel breakfast menu consists of 5 items for £4.50 and is ordered and paid at the bar on your arrival. Fill your boots from a selection of hot and cold food along with a drinks range from coffee to juice all included in the price. 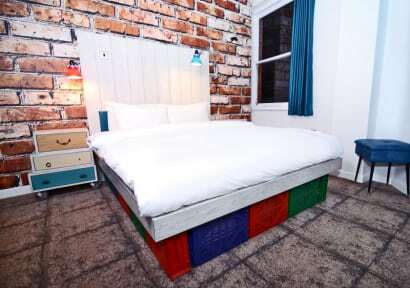 Located in the heart of the Cavern Quarter, 80 metres from the Cavern Club, the home of the Beatles. John Lennon & Eleanor Rigby can be seen from our hostel! A short walk from Liverpool’s main railway stations and all that Liverpool has to offer; world class shopping in Liverpool One, famous live music venues with the Cavern Club, Echo Arena and our own Hatch! An ideal base to visit Anfield, home of Liverpool FC and Goodison, home of Everton FC. Special rates are available for the amazing Beatles taxi tours – visit Penny Lane and the home of John Lennon!! Enjoy Liverpool’s amazing heritage and history by visiting the museums, art galleries, Albert Dock and be sure to take a ride on the Ferry across the Mersey. The reception team can help you plan your stay in Liverpool and help with booking any tours or trips you would like to do. A five minute walk from Liverpool’s main rail station (Lime Street) and 1 minute from the main bus station in the city centre. Nearby car parking is available at discounted rates. Please call reception for details. Euro hostel in Liverpool city centre is easy to get to from Liverpool John Lennon Airport and Manchester International Airport via public transport. -The Hatch screens live sporting events – check with reception team what is on! oLiverpool FC fixtures and stadium tours – Champions League! -Check the web site to see what is on for you to enjoy! Nice place to stay, unfortunately did not get our original room. Moved once after this, but happy with the room we had eventually. Lovely, helpful staff. Staff was amazing, very helpful and can give you tips. If you are in Liverpool to party, the place is perfect, but if you want to get a good night sleep choose another one, as its surrounded by pubs, bars and clubs. There is no socialising area or a kitchen. The location is a double edged sword; you're in the heart of Liverpool close to all the shops and the waterfront, as well as the area with The Cavern Club and many other bars and clubs. BUT this can mean that it can be loud out the window at night. So if you're a light sleeper you may want to take that into account. Wifi was also spotty. It worked, but I wasn't able to access youtube or streaming sites. So if that doesn't bug you then you'll cope. Shower door could have used hooks for towels. Modern hostel, conveniently located just off Liverpool One, in the city centre with comfortable beds, spotlessly clean with its’ own restaurant / bar. But, it backs onto Mathew a Street, the city’s main nightclub thoroughfare, with very loud drum and base throbbing until the early hours! So, unless you are deaf or want to join the party bring some earplugs. It’s also a tad expensive for a hostel in a provincial city.